Some of my most out-of-control spending comes from FOOD. I love going out to eat, and I love my microwave. In the past, if I didn’t go out for a meal, I only ate Lean Cuisines. And while Lean Cuisines did seem to help me lose a considerable amount of weight (almost 25 pounds since last June! ), they are pricey. Even on sale at 5/$10, they are still quite a bit more costly and wayyy less filling than a home-cooked meal. I estimate that this will make about 8 servings, so this recipe comes out to $1.43 a serving…and it’s so much better than eating Lean Cuisine Swedish Meatballs every day! It’s also high in Vitamin A, Calcium, protein, and Selenium. Plus at only 210 calories per serving, it’s going to help me feel amazing at the beach in a few weeks. Preheat over to 375 degrees and lightly oil a 10″x14″ casserole dish. Dump out cans of artichoke hearts in strainer and drain over the sink. Boil a few cups of salt water in a medium saucepan. While waiting for the water to boil, break off woody ends of asparagus and cut into 1″ pieces. Boil asparagus pieces for a couple of minutes until they’re just barely cooked. Transfer artichoke hearts to cutting board and half (or quarter if you prefer!) while asparagus is boiling. After two minutes, dump out asparagus and rinse with cold water to stop the cooking process. 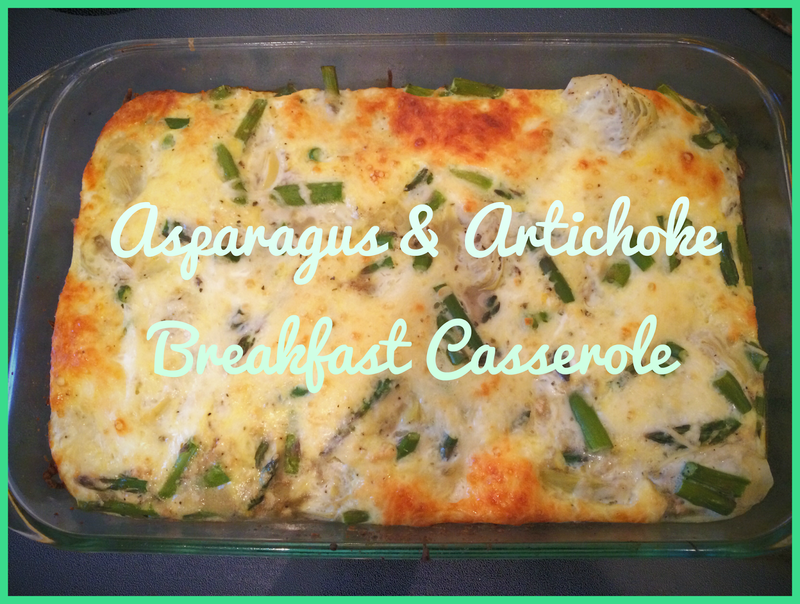 Layer the artichoke hearts and asparagus pieces in your casserole dish and season. I used salt, pepper, oregano, and basil for mine. Add 8 oz. of shredded mozzarella cheese. Crack a dozen eggs into a medium size bowl. I really liked doing this, it made me feel like I was in day one of cooking school! Whisk eggs until they’re combined and a bit fluffy. Dump egg mixture over your other ingredients and give it a little stir to combine. Bake at 375 degrees until the egg is set and the top is slightly browned. This was about 35 minutes in my oven! This recipe turned out really well. I think I may make it for a bridal shower in June, but next time I think I would add feta cheese and a few extra eggs for more richness.